Think your Klout score’s too low? Well, the social influence measurement startup is launching a revamped version of its website today that includes tools for improving your score. The main addition is a “create” section that shows a stream of content based on the topics that you’re interested in and that the people who follow your social media accounts are interested in. The main way to increase your Klout score is to post content that people engage with, so with the stream is essentially recommendations for content to share. Klout can also handle scheduling each post and will provide analytics so you can see what is and isn’t working. And the site flags different types of content in the stream. There’s On the Rise, which means the content is “on the verge of trending.” Crowd Pleaser signals content that your followers would be interested in. Hot off the Press means that it was recently published by a trusted source. And Hidden Gem is a label for content that hasn’t shown up in the news feeds of many of your followers, so you’re not just duplicating links that everyone else is sharing. 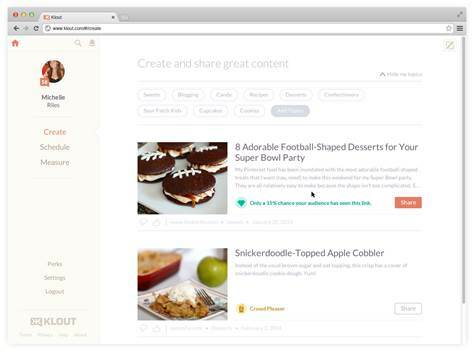 Chief Product Officer Sanjay Desai said Klout has been testing these new tools with a limited group of users and found that people are sharing an average of three pieces of content per session. He also said that initially, these features will help existing Klout users get “more value” from the service, but he thinks they could eventually help recruit new users as well, particularly as the company continues adding new capabilities. The risk, of course, is that we’ll see a bunch of people all sharing the same content in the hope of boosting their “personal brand” or whatever. The content flags should help mitigate that, and CEO Joe Fernandez said there will be more tools for creating original content later. He suggested that content sharing is “a starting point,” both from a Klout product perspective and in the sense that it’s an easy way for people who aren’t active on social networks to become more comfortable. Last year, Fernandez wrote about some of the challenges he’s faced turning Klout into a business. However, he emphasized yesterday that the monetization plan (where companies pay to promote their products to influential users as “perks”) is working, with Klout seeing revenue in the “double digit millions” for the first time last year. Both Fernandez and Desai said they’re hoping to reach profitability by early next year. The need for revenue doesn’t shape all of the company’s product decisions, Fernandez added, but there is a new opportunity to make money here by including promoted links among the content recommendations.